The time between your baby's birth and that first birthday will probably fly by. Babies have a way of keeping you so busy and enthralled by their every action that before you know it, that helpless newborn is a giggly toddler. The first year is full of developmental milestones and sources of pleasure for proud parents. Below are some general guidelines for what you can expect. Remember though, that all babies develop at their own rate and it is very common for babies to be ahead of the norm in one area and a bit behind in others. One Month: Most babies will move in jerky motions with fists clenched and will startle at loud noises. When laying down on their tummies, babies will move their heads from side to side. At this age, babies begin to recognise familiar voices and show a preference for human faces over other shapes. They can usually focus on objects near their faces. Three Months: Many babies can now support their heads well and will raise their heads and chests when placed on their stomachs. When laying on their backs, three-month-olds will often kick their legs. When held upright, baby will push their feet down on a firm surface. Your baby may be reaching and grasping items now, and is likely putting their hands in their mouth. Socially, your baby will clearly enjoy your company, rewarding you with smiles and babbling. Five Months: By now, your baby will recognise parents and other caregivers, and may act coy around strangers. Five-month-olds are often fascinated with their hands and, if your child is going to be a thumb-sucker, you will probably know it by this age. Favourite playthings include activity centres and mirrors. Teething may make your baby cranky at times and you can expect considerable drooling. 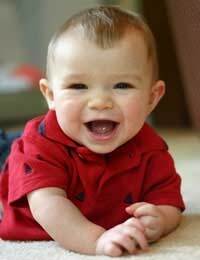 Seven Months: At this age, your baby is quite a social creature, laughing and squealing when happy. Physically, the advancements are impressive. Your baby can probably roll over, both from stomach to back and from back to stomach. They may be transferring toys back and forth between hands and will likely be putting everything into their mouth! Babies of this age enjoy games of peek-a-boo and can read emotions based on your tone of voice and facial expressions. You may also notice that your baby repeats favourite sounds, especially consonants ("la-la-la-la-"). Your baby probably began eating solid food about a month ago and by now may be letting you know which foods are favourites. Nine Months: By now, your baby will look for an item when it has dropped, indicating a level of understanding that wasn't present just a few months ago. Also, this is often the time when separation anxiety first appears, so do not be surprised if your baby objects (loudly!) when you leave. Sometimes, a comfort item, such as a favourite blanket or toy, can help ease the baby's anxiety. Your baby may be crawling well at this stage, while some babies prefer a scooching type movement (sliding on their bottom) to get them around. In any case, they are probably not content to sit still for very long. One Year: When you are ready to light that first birthday candle, your baby will have mastered a wide variety of new skills. No longer that tiny baby that you brought home from the hospital, this amazing little person is three times heavier than that wee little one and now has a very distinct personality. Your baby is now sitting unassisted, crawling, and may even have taken a few independent steps. They can pull up to a standing position and walk along, holding on to the furniture. If you hand your baby a small item, such a piece of cereal, they will be likely to take it using a pincher grasp (thumb and forefinger) rather than grabbing it open fisted. If you place items on the highchair tray, baby will happily self-feed. Your baby will be a bit of a mimic by now, imitating sounds and may even have a few simple words in their vocabulary. They will have a greater understanding of language and will understand simple commands. You may not always get the response that you hope for from a one year old, however; they are adept at shaking their heads "no", and may begin testing their limits a bit! Objects that in the past merely went into their mouths will now be used for their intended purpose. Hairbrushes, telephones, and washcloths are all familiar objects and baby will attempt to use them. While some babies do things at the expected times, that is not common. Also, keep in mind that premature babies will be likely to achieve developmental milestones a bit behind their full-term peers. Expectations should be based on a premature baby's due date rather than their date of birth. Babies, like the rest of us, are unique individuals. Siblings, even twins, do not usually achieve milestones at the same age, so try not to compare your child to others developmentally. If you sense that your baby is lagging in one or more areas, do check with your GP to schedule an assessment, but try not to worry.